At the d.confestival 2017 the HPI School of Design Thinking, Genovasi Malaysia, and the Hasso Plattner Institute of Design Thinking at the University of Cape Town agreed to launch a Design Thinking Coaches Exchange Program (CEP). 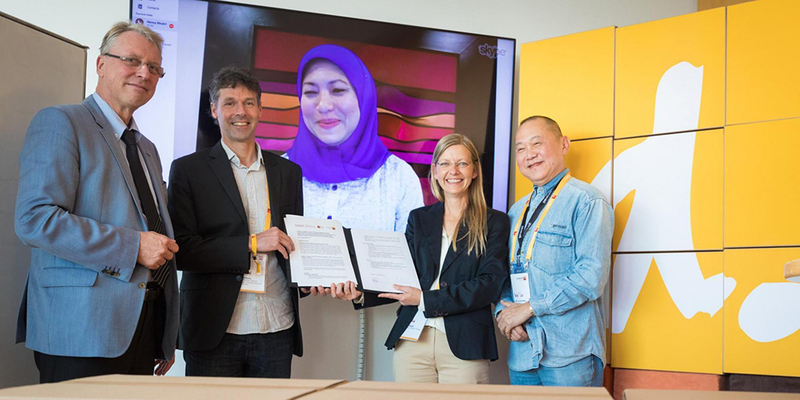 An official letter of intent was signed on 15 September 2017 by Christoph Meinel and Claudia Nicolai, Hasso Plattner Institute, Dato Lee, Genovasi Malaysia, supported by the virtual presence of YB Nancy Shukri, Minister in the Department of Malaysia’s Prime Minister Najib Razak and Member of the Parliament of Malaysia, and Richard Perez, representing the d-school in Cape Town. The CEP aims at a cross-cultural exchange about programs and experiences between Design Thinking coaches and program leads to develop and further enhance coaching practices in academic and professional settings. The collaborating Design Thinking schools intent to support and engage their best talent and give them an opportunity to grow in their coaching careers. By letting international coaches participate, both sides, the hosting D-school and the visiting coaches, gain inspiration and new contacts helping them to further develop their local program and trainings. The CEP provides a platform for participating schools and coaches to learn from project challenges in different industries and to share best practices from different cultural backgrounds. The initiative is designed as a two-week exchange program for two coaches from each D-School, planned to take place twice a year. Guided by coaches from the respective hosting country, pairs of visiting Design Thinking experts will gain a hands-on experience in a different cultural setting. Furthermore programs will be co-designed and co-led by cross-cultural faculty teams. The CEP will kick-off in spring 2018 as one of the first activities of the Global Design Thinking Alliance (GDTA), which was founded during the d.confestival. The GDTA is a network of institutions that teach, research and further develop the methods and mind-sets of Design Thinking. It promotes excellence in Design Thinking education and research. Co-initiator and partnering Design Thinking school Genovasi (the name is a combination of the Malay words for ‘generation’ and ‘innovation’) was launched in August 2012 with the initial mission to equip Malaysian youths with an innovation mindset using the Design Thinking methodology. Claudia Nicolai and the D-School Potsdam have been instrumental in the development of the government-backed Design Thinking program in Malaysia. “We are looking forward to take our partnership network to the next level and are eager the mutual exchange about the future of design thinking practice” says Claudia Nicolai. Now Genovasi also offers numerous training programs, especially for public service personnel and managers working on innovation strategies in private organizations. Training Design Thinking coaches is also an important part of the program at Genovasi. In 2017 Genovasi in Kuala Lumpur launched their Coach Apprenticeship Programme (CAP) which offers training to qualified people who want to become Design Thinking coaches. The third initiator Hasso Plattner Institute of Design Thinking at UCT was founded in 2016 in Cape Town, an ecosystem for innovation, entrepreneurship and start-ups. The d-school focuses its work on South Africa and the African continent. Experienced Design Thinking specialists from Potsdam supported the establishment and expansion of activities in Cape Town. It’s interesting to learn how Design Thinking is practiced in different cultures and in different contexts. Take a look at our brochure to learn about the GDTA and feel free to share it within your Design Thinking network.